Background﻿Monoclonal antibodies inhibiting tumour necrosis factor-α (TNFα) signalling pathway (anti-TNFα) have been widely used in Crohn’s disease (CD). However, treatment response varies among patients with CD and the clinical outcome is dependent on single nucleotide polymorphisms (SNP) in TNFα receptor superfamily 1A and 1B (TNFRSF1A/1B). Methods We tested nine SNPs in TNFα, TNFRSF1A and TNFRSF1B by TaqMan genotyping from peripheral blood samples of 104 subjects. Additionally, we quantified the effects of these SNPs on their corresponding gene expression by RT-PCR and susceptibility to Mycobacterium avium subsp paratuberculosis (MAP) infection by IS900 nested PCR. Results Four SNPs (TNFα:rs1800629, TNFRSF1A:rs767455, TNFRSF1B:rs1061624 and TNFRSF1B:rs3397) were over-represented significantly (p<0.05) among patients with CD compared with healthy controls. The TNFRSF1A:rs767455 GG genotype was found in 15/54 patients with CD (28%), while it was only found in 2/50 healthy controls (4%) (OR 9.2, 95% CI 1.98 to 42.83). The TNFRSF1B:rs3397 TT genotype was found in 15/54 patients with CD (28%) compared with (4/50) healthy controls (8%) (OR 4.4, 95% CI 1.36 to 14.14). Furthermore, the SNPs TNFRSF1A:rs767455 and TNFRSF1B:rs3397 were associated with downregulating their corresponding genes significantly (p<0.05). MAP infection was predominantly found among patients with CD in comparison to healthy controls (57% vs 8%, respectively), which was also dependent on the SNPs TNFRSF1A:rs767455 and TNFRSF1B:rs3397. Our SNP haplotype analysis of TNFRSF1A:rs767455 and TNFRSF1B:rs3397 indicates that the G–T haplotype is significantly distributed among patients with CD (46%) and MAP infection susceptibility is also associated with this specific haplotype (31%). Conclusion The SNPs TNFRSF1A:rs767455 and TNFRSF1B:rs3397, which are known to affect anti-TNFα clinical outcome in CD, were associated with lower corresponding gene expression and higher MAP infection susceptibility. There is a significant variable response among patients with Crohn’s disease (CD) receiving anti-tumour necrosis factor-α (TNFα). About 10%–30% of patients with inflammatory bowel disease have no initial response to anti-TNFα treatment. Over 50% of the anti-TNFα initial responders have lost response to treatment over time. Genetic polymorphisms in TNFRSF1A and TNFRSF1B have been shown to affect anti-TNFα treatment response significantly among patients with CD. The risk for tuberculosis infection has substantially increased in patients receiving anti-TNFα. Mycobacterium avium subsp paratuberculosis (MAP) is the most investigated suspect to be a causative pathogen in a subset of patients with CD. The single nucleotide polymorphisms (SNP) TNFRSF1A:rs767455 and TNFRSF1B:rs3397 were both associated with lower expression of their corresponding genes. MAP infection susceptibility is associated with the SNPs TNFRSF1A:rs767455 and TNFRSF1B:rs3397. SNP haplotype analysis of TNFRSF1A:rs767455 and TNFRSF1B:rs3397 indicates that the G–T haplotype has a significant difference in frequency among patients with CD, and MAP infection susceptibility is also associated with this specific haplotype. Genetic testing for TNFRSF1A:rs767455 and TNFRSF1B:rs3397, in addition to MAP infection screening methods, should be considered before initiation of anti-TNFα treatment in CD for a better clinical outcome. Clinical studies have shown that anti-TNFα therapeutics have many deleterious side effects, such as malignancy, neurologic disorders, heart failure and, more importantly, multiple infections.8 Since TNFα plays a critical role in the immune defence against infections, it was unsurprising to notice that TNFα-deficient animal models are more susceptible to develop mycobacterial infections compared with wild-type controls.9 On the other hand, patients receiving anti-TNFα treatment are at higher risk for meningitis, sepsis, histoplasmosis, and pneumonia.10–12 Moreover, the risk for tuberculosis development has substantially increased in patients receiving anti-TNFα, which might raise a question about their effect on Mycobacterium avium subsp paratuberculosis (MAP) infection in a subset of patients with CD.13–16 Thus, prescribing anti-TNFα to patients with CD without considering MAP infection could worsen disease condition eventually. Genetic polymorphisms are associated with the overall risk of developing an inflammatory disorder, and they play a role in the treatment outcome. For instance, polymorphisms in TNFRSF1A and TNFRSF1B have been shown to affect anti-TNFα treatment response significantly among patients with CD.17–19 However, the mechanism of those effects remains unknown. Predicting the efficacy of anti-TNFα treatment based on patient’s genetics and MAP infection status would be more effective and beneficial to patients by reducing the risk for adverse effects and treatment cost. In this study, we investigated the frequency of single nucleotide polymorphisms (SNP) in TNFα, TNFRSF1A and TNFRSF1B among patients with CD in comparison to healthy controls, in addition to their effect on gene expression and susceptibility to MAP intracellular infection. Finally, we further linked the effect of SNPs in these genes and presence of MAP to anti-TNFα treatment response in patients with CD. Peripheral blood from a total of 104 subjects (54 patients with CD and 50 healthy controls) was included in this study. All participants provided written informed consent prior to enrolment. Each subject provided two 4.0 mL K2-EDTA coded blood tubes, where one tube was processed for detection of MAP infection, and the second tube was processed for gene expression analysis and genotyping of nine SNPs in TNFα, TNFRSF1A and TNFRSF1B. There was no significant difference in average age or gender between the two groups (CD vs healthy controls). All subject demographics are listed in table 1. Purified white blood cells separated from blood samples were cultured in BD Bactec MGIT Para-TB Medium for 6 months of incubation at 37°C. Mycobacterial growth was measured initially using the ultraviolet illuminator and 1.0 mL was used for DNA extraction and nested PCR (nPCR) analysis as described earlier.15 20 Briefly, MAP infection was detected using MAP-specific IS900 derived oligonucleotide primers. Round 1 of amplification was performed using P90 (GTTCGGGGCCGTCGCTTAGG) and P91 (GAGGTCGATCGCCCACGTGA) primers following these conditions: 95°C for 5 min, then 34 cycles of 95°C for 1 min, 58°C for 1.5 min, 72°C for 1.5 min. Final extension of 10 min at 72°C. The amplified product from this round was 398 bp. A second round of amplification involved using AV1 (ATGTGGTTGCTGTGTTGGATGG) and AV2 (CCGCCGCAATCAACTCCAG) primers, which was performed following these conditions: 95°C for 5 min, then 34 cycles of 95°C for 1 min, 58°C for 1.5 min, 72°C for 1.5 min. Final extension of 10 min at 72°C. The final product following this round was 298 bp, which was identified on 2% agarose gel. RNA was isolated from 1.0 mL of whole blood samples, and used for cDNA synthesis in order to analyse gene expression of TNFα, TNFRSF1A, and TNFRSF1B via RT-PCR. Briefly, 1.0 mL of blood was transferred into a 2.0 mL RNase-free microcentrifuge tube, and then centrifuged at 1000 rpm for 5 min. Pellets containing leucocytes were collected and suspended in 1.0 mL of TRIzol reagent (Invitrogen) for 15 min of gentle shaking. A total volume of 0.2 mL of chloroform was added to each tube, and the mixture was then incubated at room temperature for 3 min. All tubes were then centrifuged at 11 400 RPM for 15 min at 4°C. The upper aqueous colourless phase containing RNA was transferred into a new 2.0 mL RNase-free microcentrifuge tube. A total volume of 0.5 mL of 100% isopropanol was then added following 10 min of incubation at room temperature. Each tube was then centrifuged at 11 400 RPM for 10 min at 4°C. A total volume of 1.0 mL of 75% ethanol was used to wash RNA pellets and then centrifuged at 8700 RPM for 5 min at 4°C. RNA pellets were air-dried for 15–30 min, suspended in 20 μL of RNase-free H2O, and finally heated at 60°C for 10 min. For cDNA synthesis, 600 ng of RNA from each sample was added to 0.25 mL tubes containing 0.2 mL of PCR reaction, 4 μL of iScript Reverse Transcription (Bio-Rad), and up to 20 μL RNase-free H2O. All tubes were then transferred to thermal cycler (MyGene Series Peltier Thermal Cycler) and ran for 5 min at 25°C, 20 min at 46°C and 1 min at 95°C. The final concentration of cDNA synthesised for each sample was 30 ng/μL. A total volume of 1 μL of cDNA was mixed with 10 μL of Fast SYBR Green Mastermix (Thermo Fisher Scientific), 1 μL of either TNFa, TNFRSF1A, or TNFRSF1B PrimePCR SYBER Green Assay mix (Bio-Rad) and 8 μL of molecular biological grade sterile H2O in a 96-well microamp RT-PCR reaction plate. Controls of 18s RNA gene oligonucleotide primers (forward primer: 5′-GTA ACC CGT TGA ACC CCA TT-3′; reverse primer: 5′-CCA TCC AAT CGG TAG TAG CG-3′) were used in order to obtain baseline CT readings. The 7500 Fast Real-Time PCR System (Applied Biosystems) was used to perform the RT-PCR reaction. Relative mRNA expression levels were calculated using the equation (2^(-∆CT) × 1000), where ∆CT=Sample RT-PCR CT reading − 18s CT baseline. All statistical tests were performed using GraphPad Prism V.7.02. MAP infection incidence was used to estimate the power of this study. Since patients with CD have MAP infection incidence proportion of nearly 40%, while in healthy controls MAP infection incidence proportion is about 10%,13 14 at 90% power and alpha (type I error) of 0.05, our calculated sample size was 84 samples (42 CD and 42 healthy controls). We also aimed for a similar number of Matsukura et al’s anti-TNFα treatment response study which included 81 participants.17 For genotype frequency, we used two-tailed Z test and OR analysis to compare between the presence of SNPs in patients with CD versus healthy controls. At each locus examined, SNP genotypes were subcategorised into four groups (major, heterozygous, homozygous and both heterozygous+homozygous), then tested for significance within each subcategory at p<0.05 and a 95% CI. For haplotype analysis, we used Fisher’s exact test since we had a smaller number of samples. Patients with CD were subcategorised into four haplotype groups and then tested for significance in-between MAP infection groups. A p value <0.05 was considered significant. For gene expression analysis, first, we compared the average gene expression in CD versus healthy control for each gene regardless of their genotype using unpaired two-tailed t-test at p<0.05 and a 95% CI, then we compared individuals who carried two major alleles with others for each SNP tested by using one-way analysis of variance, where Newman-Keuls post-test was selected for multiple comparisons. For MAP infection susceptibility, we compared infection proportions between SNP genotypes and major alleles in CD group and healthy controls separately using two-tailed Z test at p<0.05. Age and gender were not included as covariates as for all data sets no age or gender effects were observed. We have assessed 104 subjects (54 patients with CD and 50 healthy controls) for three SNPs in TNFα (rs1800629, rs1799964, and rs1799724), three SNPs in TNFRSF1A (rs4149584, rs767455, and rs4149570) and three SNPs in TNFRSF1B (rs1061624, rs1061622, and rs3397). Genotype distribution of these SNPs conveyed the Hardy-Weinberg equilibrium. We identified one SNP in TNFα (TNFα:rs1800629) with a significant difference in frequency in patients with CD compared with healthy controls (p<0.05). The TNFα:rs1800629 GA genotype was found in 20/54 patients with CD (37%) compared with 7/50 healthy controls (14%) (OR 3.6, 95% CI 1.37 to 9.54). As shown in table 3, the other two SNPs (TNFα:rs1799964 and TNFα:rs1799724) have shown no significance among patients with CD compared with healthy controls (p>0.05). Similarly, there was a significant difference in frequency of one SNP in TNFRSF1A (TNFRSF1A:rs767455) among patients with CD compared with healthy controls (p<0.05). The TNFRSF1A:rs767455 GG genotype was found in 15/54 patients with CD (28%), while it was only found in 2/50 healthy controls (4%) (OR 9.2, 95% CI 1.98 to 42.83). The other two SNPs (TNFRSF1A:rs4149584 and TNFRSF1A:rs4149570) have shown no significance (p>0.05). Additionally, two SNPs in TNFRSF1B (TNFRSF1B:rs1061624 and TNFRSF1B:rs3397) were found to be significant in patients with CD compared with healthy controls (p<0.05). The TNFRSF1B:rs1061624 AG genotype was found in 27/54 patients with CD (50%) compared with 15/50 healthy controls (30%) (OR 2.3, 95% CI 1.04 to 5.22). The TNFRSF1B:rs3397 CT genotype was found in 31/54 patients with CD (57%) compared with (15/50) healthy controls (30%) (OR 3.1, 95% CI 1.40 to 7.07). Besides, the TNFRSF1B:rs3397 TT genotype was also significantly found in 15/54 patients with CD (28%) compared with (4/50) healthy controls (8%) (OR 4.4, 95% CI 1.36 to 14.14). However, TNFRSF1B:rs1061622 was not found to be significant among patients with CD in comparison to healthy controls (p>0.05). A complete list of SNPs and genotyping frequency is shown in table 3. We quantified relative gene expression level of TNFα, TNFRSF1A, and TNFRSF1B in all 104 study participants. Then, we further analysed the data according to each SNP present, in order to find out if SNPs are associated with gene expression level. In general, the relative expression of TNFα was more than three times higher in patients with CD (2.44±0.30), in comparison to healthy subjects (0.72±0.20), regardless of SNPs involved (p<0.5). However, none of TNFα SNPs (rs1800629, rs1799964, and rs1799724) were associated with gene expression level significantly (p>0.05) (figure 1A–C). Gene expression level of TNFα, TNFRSF1A and TNFRSF1B according to each allele type in selected single nucleotide polymorphisms (SNP) (A–I) among patients with Crohn’s disease (CD) (n=54) and healthy controls (n=50). Unpaired two-tailed t-test at p<0.05 and a 95% CI was used to test gene expression significance in patients with CD versus healthy controls, then one-way analysis of variance (ANOVA), where Newman-Keuls post-test was selected for multiple comparisons, was used to test individuals who carried two major alleles with others for each SNP. TNFα, tumour necrosis factor. Overall, the expression level of TNFRSF1A and TNFRSF1B was significantly downregulated in patients with CD (0.38±0.15; p<0.5 and 0.34±0.13; p<0.05, respectively), compared with healthy subjects (0.79±0.24 and 0.66±0.17, respectively) (figure 1D–I). Nevertheless, patients with CD with the SNP TNFRSF1A:rs767455 who had GG genotype, had a significantly lower relative gene expression level compared with patients without SNP who had AA genotype (0.26±0.09 vs 0.49±0.12; p<0.5) (figure 1E). Similarly, the expression level of TNFRSF1B was significantly lower in patients with CD with the SNP TNFRSF1B:rs3397 who had either CT (0.32±0.11) or TT (0.2±0.09) genotype, compared with patients without SNP (0.59±0.10) who had CC genotype (p<0.5) (figure 1I). We evaluated MAP infection status in all 104 study participants by IS900 nPCR analysis, which is very sensitive and specific for MAP. Overall, 31/54 patients with CD were infected with MAP compared with only 4/50 healthy controls (OR 15.5, 95% CI 4.88 to 49.22, p<0.05). We further looked for any association between a specific genotype in all SNPs we tested and the presence of MAP infection. Interestingly, patients with CD with the SNP TNFRSF1A:rs767455 who had either AG or GG genotype were more susceptible to MAP infection (63% and 66.6%, respectively), while patients with CD without SNP (AA genotype) were 41% infected with MAP. However, this result was not statistically significant (p>0.05) (figure 2A). On the other hand, patients with CD with the SNP TNFRSF1B:rs3397 who had either CT or TT genotype were significantly susceptible to MAP infection (58% and 70.5%, respectively), compared with patients with CD without SNP (CC genotype), who were only 17% infected with MAP (p<0.05) (figure 2B). None of the additional SNPs we tested (rs1800629, rs1799964, and rs1799724 of TNFα, rs4149584 and rs4149570 of TNFRSF1A, rs1061624 and rs1061624 of TNFRSF1B) were found to be significantly associated with higher susceptibility to MAP infection. Influence of (A) TNFRSF1A (rs767455) and (B) TNFRSF1B (rs3397) single nucleotide polymorphisms (SNP) on MAP infection susceptibility in patients with CD (n=54) and healthy subjects (n=50). Infection proportions were compared between SNP genotypes and major alleles in patients with CD and healthy controls separately using two-tailed Z test at p<0.05. CD, Crohn’s disease; MAP, Mycobacterium avium subsp paratuberculosis. After we have identified TNFRSF1A:rs767455 and TNFRSF1B:rs3397 as SNPs associated with lower gene expression and higher MAP infection susceptibility in patients with CD, we further performed haplotype analysis of these two SNPs. The haplotype frequencies among patients with CD and healthy controls showed a significant difference for the G–T haplotype (p<0.05), which was found in 25/54 patients with CD (46%), while in healthy controls it was 7/50 (14%) (figure 3). Consequently, MAP infection was significantly higher among patients with CD who had the G–T haplotype (17/25), which contributes to 31% of patients with CD overall, while none of the healthy controls had the G–T haplotype and MAP infection at the same time. 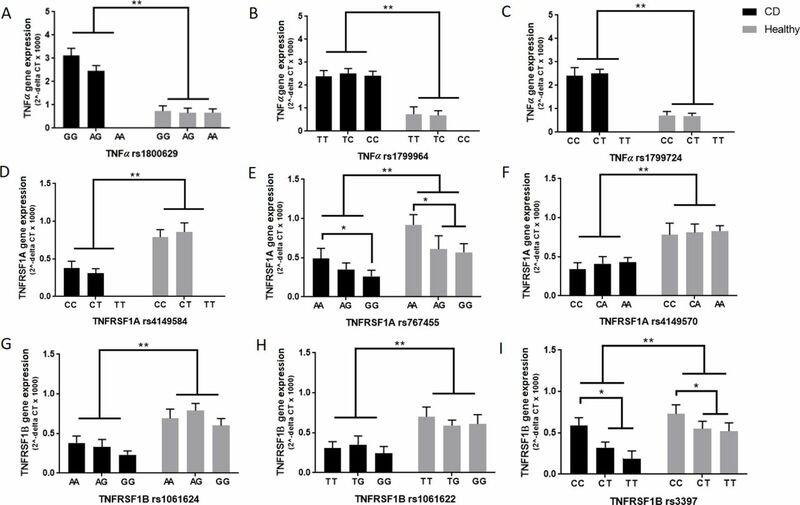 As described in table 4, none of the other SNP haplotypes inferred from TNFRSF1A and TNFRSF1B (A–C, G–C and AT) were found to be associated with susceptibility to MAP infection significantly (p>0.05). Haplotypes inferred from rs767455 (A/G) and rs3397 (C/T), and their distributions in patients with Crohn’s disease (CD) (A) and healthy subjects (B). Genetic polymorphisms in TNFRSF1A and TNFRSF1B were found to be correlated with anti-TNFα treatment response in patients with CD. Specifically, the TNFRSF1A:rs767455 AG and GG genotype has a significant difference in frequency among non-responders to anti-TNFα treatment compared with the majority of drug responders who had the AA genotype.16 Similarly, the TNFRSF1B:rs3397 CT and TT also have a significant difference in frequency among anti-TNFα non-responders in comparison to patients with CD who were classified as drug responders (CC genotype).18 30 However, these observations were limited to drug response only, while the molecular effects of these SNPs were not discussed. Since MAP is a suspected microbial causative agent of CD,14 15 31 32 it was worthy to find out if genetic polymorphisms are inducing susceptibility to MAP infection in patients with CD, which will ultimately influence anti-TNFα treatment outcome. Therefore, we tested 104 subjects (54 patients with CD and 50 healthy controls) for selective SNPs in TNFα (rs1800629, rs1799964, and rs1799724), TNFRSF1A (rs4149584, rs767455, and rs4149570) and TNFRSF1B (rs1061624, rs1061622, and rs3397). First, four out of these nine SNPs were found to have a significant difference in frequency among patients with CD compared with healthy controls (TNFα:rs1800629, TNFRSF1A:rs767455, TNFRSF1B:rs1061624 and TNFRSF1B:rs3397), which also correlates with previous reports.33–35 Second, we quantified gene expression level of TNFα, TNFRSF1A and TNFRSF1B in all study participants. We found that TNFα relative expression level is about 3.4-fold higher in patients with CD compared with healthy controls overall. However, none of TNFα-associated SNPs had a significant association with TNFα gene expression level. The expression of TNFRSF1A and TNFRSF1B was significantly downregulated (~2-fold) in patients with CD compared with healthy controls regardless of SNPs involved. Furthermore, the SNPs TNFRSF1A:rs767455 and TNFRSF1B:rs3397 were both found to be associated with a significant lower gene expression. Additionally, MAP infection was predominantly found among patients with CD in comparison to healthy controls (57% vs 8%, respectively). Interestingly, MAP infection was also associated with the SNPs TNFRSF1A:rs767455 and TNFRSF1B:rs3397. Furthermore, our SNP haplotype analysis of TNFRSF1A:rs767455 and TNFRSF1B:rs3397 indicates that the G–T haplotype has a significant difference in frequency among patients with CD (46%) and MAP infection susceptibility is also associated with this specific haplotype (31%). It is relevant to compare between MAP and M. tuberculosis infection since mycobacterial protein tyrosine phosphatase (PtpA) in MAP shares 90% homology to PtpA in M. tuberculosis.36 This protein inhibits phagosome–lysosome fusion in the macrophage by dephosphorylating the host vacuolar protein sorting 33B. Consequently, the pathogen will be able to avoid containment eradication and it establishes a successful intracellular infection by preventing fusion of lysosome and phagosome into the phagolysosomal complex.37 38 Therefore, the primary mechanism for MAP eradication is by inducing apoptosis of the infected macrophage through TNFα-dependent mechanism.39 40 This is a critical point when we consider anti-TNFα treatment for patients with CD who are infected with MAP. In addition to genetic testing of selective SNPs we discussed, MAP infection screening method should be implemented before initiation of therapy. Finally, in figure 4, we suggest following a treatment algorithm for CD, based on patient’s haplotype inferred from TNFRSF1A rs767455 (A/G) and TNFRSF1B rs3397 (C/T). Recommended Crohn’s disease (CD) treatment algorithm based on haplotypes inferred from TNFRSF1A rs767455 (A/G)–TNFRSF1B rs3397 (C/T). MAP, Mycobacterium avium subsp paratuberculosis; SNP, single nucleotide polymorphism; TNFα, tumour necrosis factor. Our thanks are due to all members of Dr Naser’s lab and to Brent Cao for his valuable assistance in the statistical analysis. A sincere acknowledgement to all the subjects whose clinical samples were included in this study.
. TNF-alpha and apoptosis: implications for the pathogenesis and treatment of psoriasis. J Drugs Dermatol 2002;1:264–75.
. Side effects of anti-TNF therapy: current knowledge. Clin Exp Rheumatol 2002;20(6 Suppl 28):S152–7.
. Integrating theories of the etiology of Crohn's disease. On the etiology of Crohn's disease: questioning the hypotheses. Med Sci Monit 2006;12:RA27–RA33.
. Evidence that vesicles containing living, virulent Mycobacterium tuberculosis or Mycobacterium avium in cultured human macrophages are not acidic. Infect Immun 1991;59:1823–31.
. Evidence for inhibition of fusion of lysosomal and prelysosomal compartments with phagosomes in macrophages infected with pathogenic Mycobacterium avium. Infect Immun 1986;52:252–62.
. Programmed cell death of Mycobacterium avium serovar 4-infected human macrophages prevents the mycobacteria from spreading and induces mycobacterial growth inhibition by freshly added, uninfected macrophages. J Immunol 1997;158:4320–7. Contributors AQ is the primary author who performed all experiments, collected data and participated in writing the manuscript. SR is our collaborator gastroenterologist at the Digestive and Liver Center of Florida, who provided us with clinical samples. SAN is the leading investigator in the lab and has supervised all aspects of the study including writing and editing of the manuscript. Funding This study was funded, in part, by the Florida Legislative Grant and UCF Doctoral Research Support Award. Ethics approval University of Central Florida Institutional Review Board (IRB00001138). Data sharing statement The data sets supporting the conclusions of this article are included in the article.